Dr. Felix and her team of professionals at Vista Family Dental Care are passionate about your oral health, going above and beyond to make sure you are able to get the treatments you need without being a burden on your wallet. We understand the importance of flexible financing options. That’s why we accept most major insurances, all major credit cards, and CareCredit. Thank you for choosing Dr. Felix with Vista Family Dental Care. To show our appreciation for having you as a new patient, enjoy our gift to you. 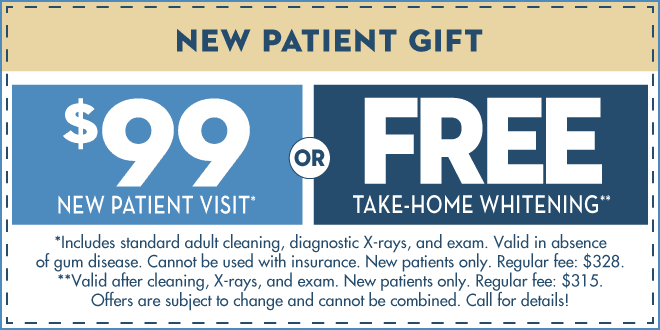 Click the coupon for a printable version, and bring it with you to your next dental visit. We can’t wait to see you smile! Don’t see your insurance listed? We’ll be happy to help find your coverage. Contact us! CareCredit is a special healthcare financing option that allows you to pay monthly over a set period of time. The difference between this and other credit cards are the amazing interest-free payment plans. Care Credit offers options of 6, 12, 18 and 24 monthly fixed payment plans that will accrue no interest if paid in full. This means you can enjoy all the benefits of good oral healthcare without insurance or straining your current financial situation. Is CareCredit Right For Me? CareCredit is right for anyone who is looking to improve his or her oral health. Not everyone has the luxury of dental insurance or the ability to add more money onto his or her existing credit cards. CareCredit is a great alternative option available so you don’t have to put off your dental health. You can use your card again and again as your own health care line of credit. You can pay monthly or the full balance off at any time. Care Credit is simple and straightforward, just pay for the treatments you need. You can even use it on your pets! You’ll receive monthly statements in the mail or online just like any credit card. Still have questions? We’ll walk you through it!